You can't believe everything you read. That's true just on the face of it. But that's not necessarily how you sell books. There's been a lot of book action on celiac disease and gluten sensitivity in the past few years. Some authors have gone so far as to suggest that these problems are the cause of the epidemic in Alzheimer's disease. But is there any truth in that? If you have gluten sensitivity here's a reason to celebrate tonight. A study published just last month says no. The researchers looked at a large group of 8,846 men and women who had proven celiac disease. The diagnosis in all of these patients was made by actually biopsying their small intestines. This is the only absolutely accurate way to diagnose celiac. All of the patients were over 50 years old and the average age was 63 years. They followed the group for an average of 8.4 years to see how many of them developed dementia. And then they compared the results to another group of men and women who did not have celiac disease. The results were clear: 4.3% of the celiac patients developed dementia; 4.4% of the non-celiac patients developed it. Absolutely no difference at all! According to the authors, "Patients with celiac disease are not at increased risk for dementia overall." One of the most common complaints patients with gluten sensitivity and celiac disease have is "brain fog." Brain fog is a term used to describe feelings of disorientation, difficulty focusing, and lapses in short-term memory. So it's easy to understand why some may be concerned that this could lead to dementia later on. 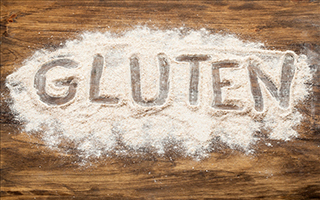 Studies show that gluten contains certain proteins called opioid peptides or "exorphins." And just like opium, these peptides can interfere with brain function. Also, in sensitive people, gluten causes inflammation, which also can irritate the brain and cause it to malfunction. But as the results of this study show, the brain fog that gluten causes does not actually damage the brain. All you have to do is to stop eating gluten and you're good as gold. As one of the authors of the study put it, "People who promote an anti-grain or anti-gluten agenda sometimes cite our work in celiac disease, drawing far-ranging conclusions that extend well beyond evidence-based medicine. We know ‘brain fog' is a serious symptom commonly reported by our patients, and it's understandable that people have been worried about a possible connection to dementia. Fortunately, our work with Dr. Ludvigsson provides concrete evidence that this particular worry can be laid to rest." So if you're suffering from the symptoms of brain fog, it's not a bad idea to stop eating gluten for a month to see if the symptoms get better. If they do, great. But if they don't, you might want to try taking Advanced Memory Formula. This is a formula I developed that contains several key ingredients for better brain function. And the great thing about it is that it works fast. No brain formula works in everybody. Just take it as directed for one bottle. You should see results that soon. Lebwohl B, Luchsinger JA, et al. Risk of Dementia in Patients with Celiac Disease: A Population-Based Cohort Study. J Alzheimer's Dis. 2015 Sep 29.